In an interview with the German magazine Der Spiegel, Iraq's Prime Minister Nouri al-Maliki said he supported a plan proposed by Democratic presidential candidate Barack Obama to withdraw U.S. troops from Iraq within 16 months. When asked when he thinks U.S. troops should leave Iraq, al-Maliki told the magazine, "As soon as possible, as far as we are concerned." He added, "U.S. presidential candidate Barack Obama is right when he talks about 16 months." 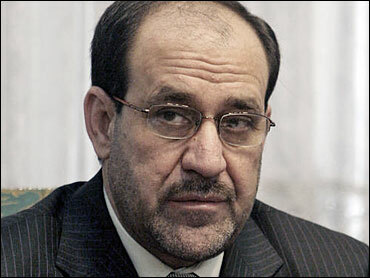 Al-Maliki deferred, however, from offering outright support for Obama's candidacy. "Of course, this is by no means an election endorsement," he said. "Who they choose as their president is the Americans' business." The prime minister, who has spoken of setting a timetable for U.S. withdrawal - an option that has been anathema to the White House - discounted the Bush adminstration's concerns. "So far the Americans have had trouble agreeing to a concrete timetable for withdrawal, because they feel it would appear tantamount to an admission of defeat," al-Maliki told Der Spiegel. "But that isn't the case at all. If we come to an agreement, it is not evidence of a defeat, but of a victory, of a severe blow we have inflicted on al Qaeda and the militias." The Obama campaign's national security adviser said the Illinois Democrat welcomes al-Maliki's support. In a statement, Susan Rice said al-Maliki's position "presents an important opportunity to transition to Iraqi responsibility." "Unless al-Maliki reverses course on this reported remark, his statements should be a major boon for Obama," said CBSNews.com senior political editor Vaughn Ververs. "His seeming endorsement of Obama's troop withdrawal timetable - especially when the candidate is on the ground in the Middle East - could undercut one of John McCain's main rationales for his candidacy - that is, winning the war in Iraq and exiting when events on the ground warrent. "If the Iraqis are pushing the U.S. to leave, it will be hard for McCain to argue we should stay for an indefinate period of time." The story of al-Maliki's backing of Obama's 16-month withdrawal plan is also embarrassing to the White House, which has curdled at talk of a timetable. But news of the interview was made even more pronounced when a White House staffer accidentally e-mailed a Reuters article about al-Maliki's comments to reporters, thereby giving it even more exposure than the German interview might have generated. A White House spokesman said, "It was a mistake," claiming it was intended to be part of an internal distribution of news clips. As to the substance of the prime minister's comments, CBS News White House correspondent Mark Knoller reports that the Bush administration is taking al-Maliki's approval of a timetable (or, perhaps, an "aspirational time horizon") as a sign of success on the part of the U.S. government. "It is because of the President's bold surge strategy that we've been able to achieve the gains we're seeing today - be it security, economic or political progress (evidenced today by the Sunni bloc coming back into the government)," White House Spokesman Scott Stanzel said. "It is our shared view that should the recent security gains continue, we will be able to meet our joint aspirational time horizons," Stanzel said. Senior leaders of al Qaeda may be diverting fighters from the war in Iraq to the Afghan frontier area, the top American commander in Iraq told The Associated Press on Saturday. Gen. David Petraeus also said al Qaeda may be reconsidering Iraq as its highest priority war front. "There is some intelligence that has picked this up," he said in the interview in his office at the U.S. Embassy along the Tigris River. "It's not solid gold intelligence," he added, stressing that the reliability of the information has not been confirmed. Petraeus said the information was based on human intelligence, meaning informants. "There are unsubstantiated rumors and reflections that perhaps some foreign fighters originally intended for Iraq may have gone to the FATA," he said, referring to the Federally Administered Tribal Areas of Pakistan, where militants have a secure staging ground for movements into neighboring Afghanistan. Petraeus said that until now, al Qaeda communications have made clear that Iraq is its highest priority for battle. "That could be under review." British Prime Minister Gordon Brown said Saturday that plans are being made to scale back troops in Iraq, but refused to consider an "artificial timetable" for withdrawing Britain's remaining 4,000 soldiers. Brown's comments - following meetings with Iraqi leaders - come in advance of next week's scheduled address to British lawmakers on Iraq, when he is expected to give more details on troop reduction plans as insurgent attacks and militia violence drops sharply around Iraq. No specific troop withdrawal figures have been made public, but a senior British military officer has predicted substantial troop cuts in Iraq next year. "It is certainly our intention that we reduce troop numbers, but I am not going to give an artificial timetable at the moment," Brown said following talks with Prime Minister Nouri al-Maliki and President Jalal Talabani. A departure of more British forces will have little bearing on the battlefield. The troops, mostly based outside the southern city of Basra, no longer have a combat role and are involved mostly with training Iraqi security units. Although Britain maintains the second-largest foreign military force in Iraq, it is dwarfed by the approximately 150,000 U.S. soldiers currently in the country.